Figure 1. Cross-correlation between "Hold-Everything" segments of Channel I and II spectra. 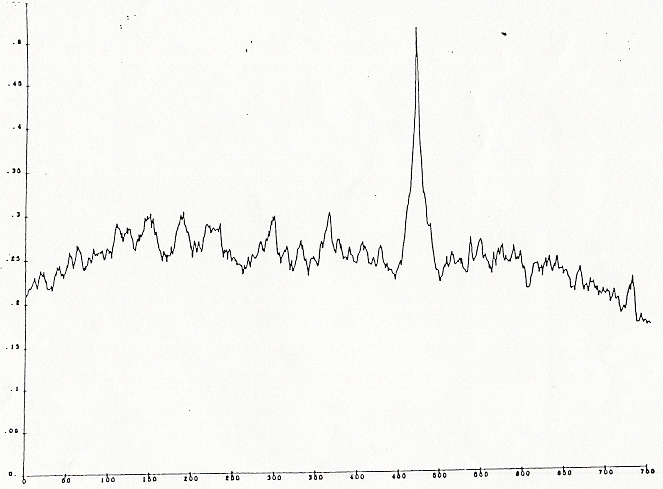 The curve is produced by sliding 2.50 secs of the Channel-I spectra along 10.00 secs of the Channel-II spectra, 0.01 sec at a time, using frequencies in the band 600-3500 Hz. The horizontal axis is time (centiseconds) and the vertical axis is the corss-correlation coefficient (ρ).